Here's your daily Nordschleife diversion: nine minutes of professional footage from the dawn of aerodynamics. The video has no narration and is in black and white, but the soundtrack and the ample helicopter time more than make up for the loss. It’s an interesting period piece from the ultra-rapid decade of aerodynamic development, which took cars from the thin aluminum cigars with no downforce of the mid-60s to the ground effect Lotus 78’s and 79’s which had wings underneath, sucking them to the tarmac. 1969 was only the second year where aerodynamics was in play in Formula One and you can clearly see the results. Every car is equipped with a solid rear wing and various front wings. At the Flugplatz straight, where the no-downforce cars of 1967 would take to the air, ‘69 cars hunker down and stick to the ground. Also visible is a token nod to safety—roll bars!—accompanied with its total disregard otherwise. People stand inches from a track with no Armco—not even bales of hay. The race was won by the Jacky Ickx of Belgium in a Brabham. The guy in the ditch at 04:07 is his teammate Piers Courage, who crashed out on lap one. 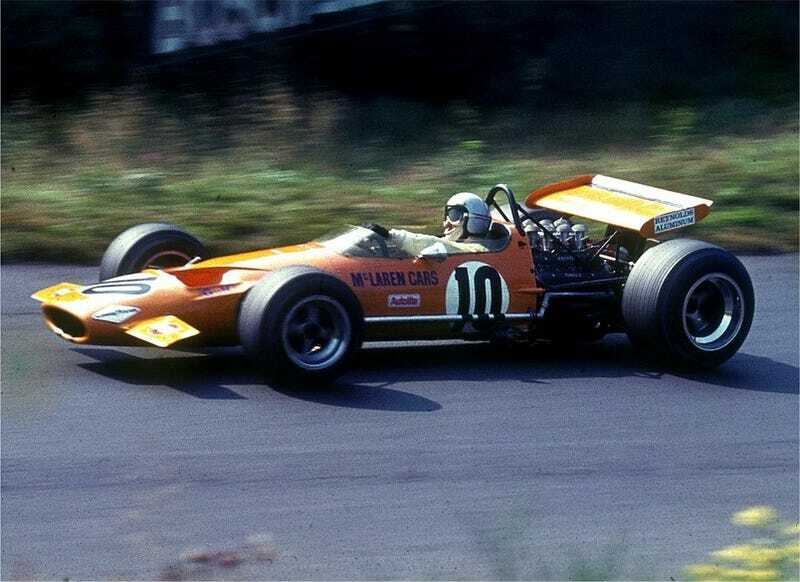 He would become Formula One’s next casualty in less than a year’s time, when he burned to death in his magnesium De Tomaso at the 1970 Dutch Grand Prix. And in just seven years, following Niki Lauda’s famous—and similarly fiery—crash, Formula One would be gone from the Nürburgring Nordschleife for good.